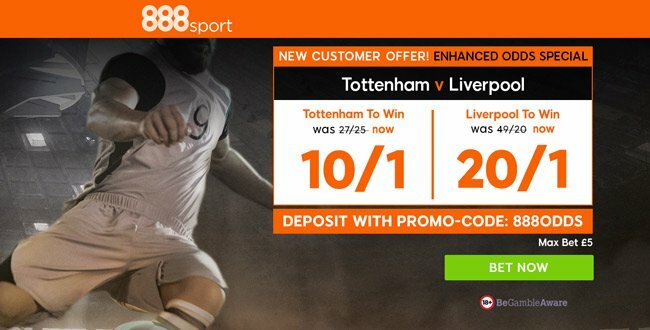 Back 10/1 Tottenham or 20/1 Liverpool to win at 888sport! Max bet £5! Tottenham and Liverpool go head to head in an unmissable Super Sunday clash in Premier League. Are you placing a bet on this match? 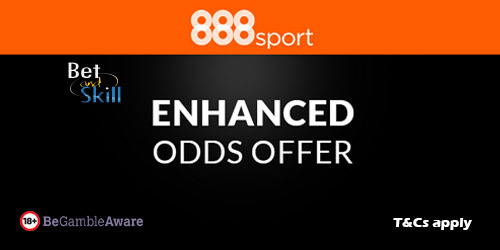 888sport are offering enhanced odds - Tottenham to win @ 10/1 or Liverpool to beat the Spurs at 20/1! Max bet £5! Spurs are unbeaten in the last 10 games across all competitions (W7 D3) and earned their first win Premier League win at Wembley when they welcomed Bournemouth last weekend. Liverpool are unbeaten in their last four away league games against Spurs (W2 D2), conceding just one goal in that time and netting nine themselves. Join 888sport and choose your price boost - 10/1 SPURS or 20/1 LIVERPOOL to get all three points! "Back 10/1 Tottenham or 20/1 Liverpool to win at 888sport! Max bet £5!"